Tonight in front of a sold out Phones 4U Arena (formerly known as the Manchester Evening News Arena) in Manchester, at the top of a stacked Matchroom Sports card, one of the most eagerly anticipated match ups in British boxing will take place between two of the best Super-Middleweights, not just in Britain, but in the world as a whole. In one corner stands the experienced World Champion in the shape of Nottingham’s Carl Froch, the Super-Middleweights Division’s number two ranked fighter behind the unbeaten former Olympian Andre Ward, who currently holds the World Boxing Association portion of the 12 stone crown. Froch, a 36 year old veteran who is in his 11th World title fight in row since clinching the World Boxing Council title back in 2008 in a 12 round classic against the Canadian based Haitian Jean Pascal at the Nottingham Arena. Froch has since been engaged in the toughest run of fights of any current boxer anywhere in the World. And facing the Nottingham man in the opposite corner tonight is a young lion and fellow Briton in shape of Hammersmith’s George Groves, who like the older Froch, is a former British and Commonwealth champion in the 12 stone division. However, unlike Froch, Groves did not secure the prestigious Lonsdale belt outright on his climb to the top. The build up to this fight has seen plenty of needle between both men with Groves claiming to have the psychological and emotional advantage against the older and more experienced Froch. Froch has stated that he is determined to knock out Groves as Carl feels the challenger has also been disrespectful towards him in relation to what Froch has achieved in a 11 year professional career. 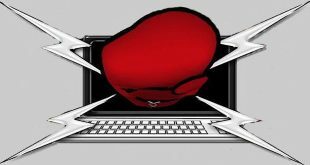 However, it can be argued that Froch has the psychological advantage with the superior championship experience, plus when he has sparred Groves a few years ago, he dropped him with 16oz gloves on, so one does ask what damage can Froch do with the 10oz gloves that will almost certainly be used in this fight. Also, Froch has been dropped a lot later in his career in comparison to the younger Groves. Groves was dropped and was in serious trouble when he fought the Scotsman Kenny Anderson in his maiden defence of the Commonwealth title. Groves displayed complacency against Anderson and was rightly punished for it when the Scotsman floored with him with a short left hook in the third round. However, after getting reorganised following a receiving of the Riot Act by his trainer at the time, Adam Booth, Groves then started to box more and gradually broke Anderson down, stopping him in the sixth round. Froch was not dropped in his own professional career until he faced Jermain Taylor, the former undisputed Middleweight champion of the World, in his mandatory defence of his WBC title over in the United States in April, 2009. Froch was dropped in the third round of this fight, however, he showed his grit and determination and hauled himself back into the fight against Taylor. Taylor then ran out of gas as the fight progressed, which saw Froch capitalise, scoring a knockdown in the final round with just over a minute left of the fight before pulling out one of the most dramatically late stoppages ever seen in a boxing ring against the American. Had Froch failed to stop Taylor in such a dramatic manner, he would have lost his WBC title and it would have been highly unlikely Froch would have been able to embark on the extraordinary run that he has been involved with. Had Froch lost against Taylor, he would probably not have been part part of the Super Six World Boxing Classic that would see Froch lose his WBC title to friend and great rival Mikkel Kessler in a 12 round classic. Froch regained the aforementioned title against the German based Armenian Arthur Abraham in one of Froch's finest performances in which he restrained his natural attacking instincts against a noted puncher in the shape of the former IBF Middleweight king. The Englishman worked off his jab and used his sometimes-overlooked ring intelligence along with bodyshots to Abraham’s stockier frame to hammer out a dominant points win to regain his WBC title. 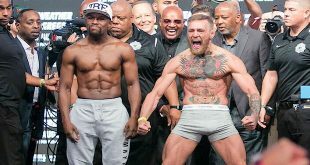 Froch would also emerge victorious in the Super Six against late replacement and former Light-Heavyweight World Champion Glencoffe Johnson in a fight that initially swung back and forth for the first eight rounds. "The Cobra" made an adjustment and was successful in keeping the older and more experienced Johnson at bay to clinch a dominant points decision. Over the well documented last three years, Froch began this stretch losing to the second best Pound for Pound Ffghter in the world in the shape of Andre Ward, losing his WBC belt in the process to the American star. However Froch would not remain beltless for long. In his first fight in the UK in three years, Froch’s promoter, the charismatic Londoner Eddie Hearn, was successful in tempting the then unbeaten IBF Champion Lucian Bute to leave Quebec to take on Froch in his home city of Nottingham. 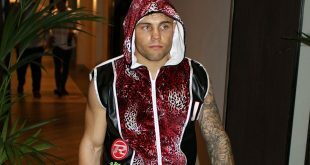 What followed was an electrifying performance from the Nottingham man as he looked to back up Bute and prevent the Canadian from showing the knockout power that made him one of the most feared fighters in such a talent rich division. For the five rounds that the contest lasted, Froch pressed and harassed Bute, never allowing him to rest and get himself established in the fight before Froch delivered the blow that snapped Bute’s head back, forcing the stoppage. Then came the three round demolition of Yusaf Mack and the legendary Mikkel Kessler rematch at the O2 Arena where Froch took the first four rounds by working off his long and accurate left jab before engaging in a lively exchange for the rest of the contest. In the 11th and 12th rounds, Froch came close to stopping his great friend Kessler in a Fight of the Year candidate. As for Groves, his opportunity to take on the more experienced Froch came after he defeated the Argentinean based Urguayan Noe Gonzalez Alcoba in five rounds to take a minor WBA title. In this performance against Alcoba, who was dominated by the German middleweight Felix Sturm in his only World title shot to date, Groves took his record to 19-0 as he displayed fast hands and accurate punching that backed up Alcoba and score a good knockdown before a booming overhand right sent Alcoba down for the second time and for good. Groves has two common opponents with Froch. The first is the Ghanian, Charles Adamu, for the Commonwealth Super-Middleweight crown. Froch defeated the experienced Accura born Adamu in 2004 at the Ice Arena in Nottingham on a points decision, while Groves defeated Adamu with a sixth round stoppage in 2010, to inflict the only stoppage loss on Adamu’s slate, at the MEN Arena, the same venue, since renamed, in which he will engage Froch in combat on Saturday night. It can be argued that it was an ageing and rusty Adamu that Groves faced and emerged victorious in just his ninth professional contest to clinch his first major title, the Commonwealth belt. The second common opponent is the experienced Glencoffe Johnson, against whom Groves successfully retained his Commonwealth title against back in December, 2012. Like Froch, Groves could not stop the vastly more experienced Jamaican, who has mixed with some of the finest fighters from Middleweight to Light Heavyweight in his 72 fight professional career. But Groves produced a far more dominant performance in comparison to Froch, as he achieved a total shut out on two of the three judge's scorecards to retain the Commonwealth title, in which many people felt was a coming of age performance for the Hammersmith fighter. However away from Adamu and Johnson, Groves has boxed predominately at Commonwealth and British level and does face a quite considerable step up when he challenges Froch in his first and overdue World title fight. Groves had previously been scheduled to fight Robert Stieglitz for the World Boxing Organisation’s portion of the 12 stone title, but the fight fell through as Groves was forced to pull out through injury, allowing Arthur Abraham to take his shot and become a two weight World champion by defeating Stieglitz. While at British level, Groves clinched the Lonsdale belt after defeating bitter amateur rival James DeGale at the O2 Arena in May 2011 in a tight majority decision in which Groves’ surprised many observers by looking to use his footwork and movement to slip and slide against the Beijing Gold Medalist at Middleweight. However, six months later at the Wembley Arena, Groves flirted with disaster against Liverpool’s Paul Smith, a former British champion, after being caught with 10 seconds of the opening round remaining. Groves fully focussed at the task at hand in the second round and showed his boxing ability before cracking a powerful right hand that dropped Smith, forcing the second round stoppage. The knockout win over Smith, and in the manner it was done, caused a mild tremor on the British scene, as many people felt that the Liverpudlian possessed too much in terms of size and experienced for Groves, who was in his 13th professional fight when he fought Smith. This was followed several wins against the likes of fringe contender Francesco Sierra, in which Groves suffered a cut in the third round before eventually scoring the stoppage win in the sixth frame, and then by wins over two unheralded journeymen prior to the Alcoba win. What Groves brings to the fight against Froch is youth as he is only 25 years old in comparison to Froch, who is 36 years old. As a result of this youth, Groves has only had 19 professional contests and has boxed just 95 rounds while Froch has had 33 fights and boxed 231 rounds. In those 231 professional rounds, Froch has completed 12 rounds on nine occasions while Groves has only been twice the full Championship distance in his professional career, against Johnson and DeGale, which have been at much lower levels than what he faces tonight. Froch has gone 12 rounds at World title level against the likes of Kessler twice, Abraham, Ward, Pascal and Johnson and Andre Dirrell and thus has the superior championship experience and temperament in those respects. 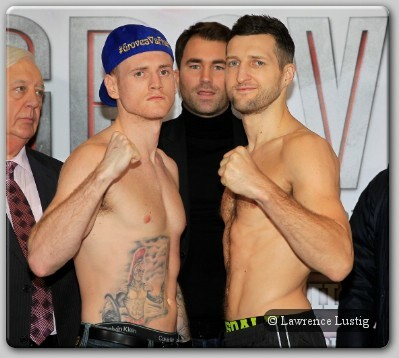 Froch also has physical advantages in terms of height and reach, standing 6ft1 inches tall in possession of a 75 inch reach in comparison to Groves, who is only 5ft11 and a half inches tall with a 72 inch reach. So, from those advantages in size and championship experience, Froch may start in some people’s eyes as the favourite. However, the number of tough fights in which Froch has been engaged in may cause observers to feel that age may catch up on Froch against Groves, the younger fighter with the greater knockout percentage, although it can be argued that he has delivered these knockouts at a much lower level. This is a potential crossroads fight for both men as Froch looks to cement his legacy as one of the most successful British fighters since the Second World War, while the younger Groves will be looking to implement a changing of the guard on tonight. Tactically, this writer expects that Froch will look to start fast by working off his left jab to set up his straight hand and left hook to test Groves’ chin, while Groves will be looking to implement his upper body movement to make Froch miss and counter the champion effectively. But Froch showed in his bout against Johnson that he can make adjustments mid-fight and can switch tactics and unsettle his opponents, use his superior championship experience to either retain his titles by a comfortable points decision or by a late stoppage as he looks to teach the younger Groves’ a few lessons about respect.